Medicinal mushrooms have a long history of uses throughout the world. Chinese medicine provides written references for many fungi species dating back to 100 BC detailing their use in respiratory ailments, debility, and cancer. Mushrooms also played a vital part in the development of Mesoamerican cultures such as the Aztec, Inca and Mayan. Cordyseps sinenis is a well known traditional aphrodisiac and tonic. Hundreds of years ago it was commonly used in North Sikkim and other Himalayan regions. The first reference to cordyceps as a medicinal fungus occurred around 101 B.C. in a book titled, “The Classic Herbal of the Divine Plowman. Two thousand years have passed since the Greek physician Dioscorides included Laricifomes officinalis in his De Materia Medica that was written about the year 65AD. Also known as agarikon, it was used as a treatment for “consumption,” a disease now known today as tuberculosis. This perennial polypore is believed to be the longest-living fungi. It has been use by indigenous peoples in many countries for hundreds of years to help with coughs, asthma, bleeding, rheumatoid arthritis and infections. Ancient Greeks called this an elixir to live a long life. 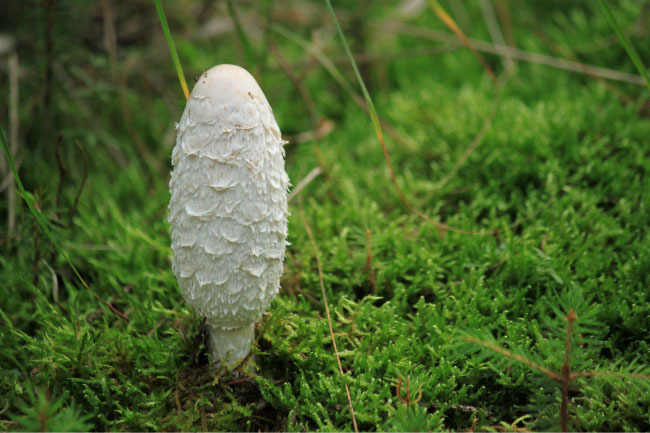 Modern research shows that this fungus has strong anti-inflammatory, anti-viral and anti-bacterial properties. For hundreds of years, the Haida of British Columbia and other Northwest Coast First Peoples used Laricifomes officinalis as medicine for a variety of ailments. The Haida gave Laricifomes officinalis a name that translates into “ghost bread” or “tree biscuit. Laricifomes officinalis, or Fomitopsis officinalis, is the same fungi but its name depends on which tree it grows on. Fomitopsis officinalis was once common throughout most temperate regions of the world yet it is now believed to be extinct in most of Europe and Asia. It can still be found deep within the old-growth forests of the Pacific Northwest (British Columbia, Oregon and Washington). Mycologists today consider this to be very valuable and an historical fungus. 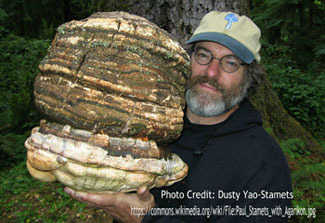 Mycologist Paul Stamets has worked with the University of Illinois to closely study the medicinal benefits of agarikon. He and other researchers found that the administration of agarikon showed anti-tubular activity when testing against the tuberculosis bacteria which reaffirms ancient beliefs. They also reaffirmed that eating the fungi can reduce inflammation and that it can be used to help combat bacterial and viral infections. Stamets’ (et al) research has shown that agarikon has strong activity against cowpox, swine and bird flu and the virus that causes herpes. Stamets claims that the effectiveness was better in some cases than conventional therapies. Over 5,300 years ago, Ötzi was crossing the mountains in Southern Tyrol, where he was murdered and time preserved him in the ice. He was discovered accidentally by hikers in 1991, together with his clothing and equipment, on the Schnalstal/Val Senales Valley glacier and has been extensively studied since then. Two types of fungi were found on him: Piptoporus betulinus (birch polypore) and Fomes fomentarius (tinder hoof). Birch polypore is edible and also has many medicinal values. Őtzi had several health issues including parasites which this fungus is known to help eliminate from the body. It also is recognized for its ability to fight infections. Fomes fomentarius was the other fungi found on Őtzi. This is often called tinder hoof and can safely be used as a warm coal for a few hours. It was safely used as a coal to keep warm. Today, tinder hoof is used to make amadou as well as for medicinal uses. Fungi and animals are more closely related to one another than either is to plants. Diseases of plants typically do not afflict humans whereas diseases of fungi do. Since animals (including humans) and fungi share common microbial antagonists such as Escherichia coli (E coli) and Staphylococcus aureus we can benefit from the natural defensive strategies of fungi that produce antibiotics to fight infection from microorganisms. In a recent in vitro study, extracts of more than 75 percent of polypore mushroom species surveyed showed antimicrobial activity and 45 percent of 204 mushroom species (polypores and gilled mushrooms) inhibited growth of a wide variety of microorganisms. Dozens if not hundreds of mushrooms have antioxidant properties. Many mushrooms contain antioxidant substances that can prevent the destructive oxidative process within an organism and within us. There is not a doubt that mushrooms comprise a vast and yet largely untapped source of powerful new pharmaceutical products. They are an unlimited source of polysaccharides (long chains of simple sugars) which possess anticancer and immunostimulating properties. Polysaccharides found in mushroom do not directly attack cancer cells but produce anti-tumour effects by activating different immune responses in the host. This certainly is great news in today’s world when seeking safe and alternative ways to treat ailments that (sadly) afflict far too many of us. Stamets P. 2006. Antiviral activity from medicinal mushrooms. U.S. Patent 2006/0171958 A1, filed March 22, 2006. Ranadive, Belsare et al. Glimpses of antimicrobial activity of fungi from World. Journal on New Biological Reports (2(2): 142-162 2013. Do you have a reference for Larcifomes and Fomitopsis being same fungus on different trees? The source is at the bottom of the article – more specifically, it is the article that appears at Treehugger. Great article very informative. Thank you!!! I am reading so much of your stuff. You write better than anyone else and your research is thorough. Thank you for all you do! Thank you so much for your kind words!! And you are most welcome!